In the third in a three-part series on the fast-casual market in Europe, Darren Tristano covers some of the European chains that are making their way to the United States. Some of America’s most successful fast-casual chains, including Chipotle, Five Guys and Smashburger, conduct a significant amount of business overseas. At the same time, several European concepts see the United States as fertile ground for their own growth. As its name suggests, Maoz Vegetarian specializes in vegetarian fare with a menu that centers on sandwiches, salads and gluten-free falafel. The Amsterdam-based limited-service concept gained popularity for its simple service style—patrons choose a salad or sandwich for a fixed price, then visit the salad bar to add as many toppings as they choose for no additional cost. In 2004, Maoz opened its first U.S. location in Philadelphia. It now operates about a dozen units in the U.S. in Texas, Illinois, New York, New Jersey, Pennsylvania and Florida. 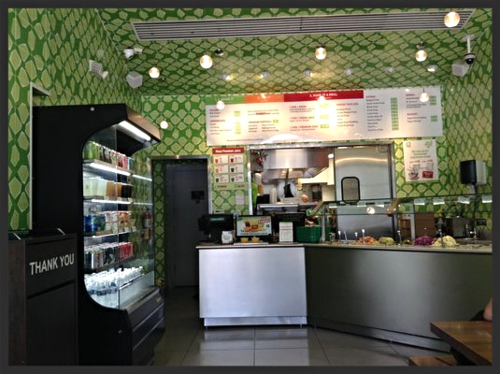 Maoz has a relaxed service approach that allows customers to add their own toppings to their sandwiches and salads instead of charging by weight, as at other salad bar concepts. Another differentiating factor: Maoz gives out doggy bags to patrons who don’t finish their meal, an amenity typically not offered at salad bars. Nando’s is a fast casual chicken chain specializing in Portuguese-style peri peri chicken. Since launching in 1987 in South Africa, Nando’s has expanded to more than 1,000 locations in about two-dozen countries, but it’s especially popular in the U.K. The concept first expanded to the U.S. in 2008 with a unit in Washington, DC. Nando’s now operates 15 units in DC, Virginia and Maryland. From 2012 to 2013, Nando’s opened five locations in the U.S., propelling a nearly 40% increase in U.S. sales to $21.4 million. Nando’s offers a worldly experience, with Portuguese-style chicken and a mix of Portugal and South African wines served in units decorated with African artwork. The chain also showcases the best qualities of a fast casual concept—lavish decorations make for an inviting place to dine, while speedy service attracts on-the-go patrons. Vapiano operated in the U.S. much the same as its fast casual Germany counterpart. The concept offers made-to-order pizzas, pastas, salads and more from a variety of food stations. Everything on the menu is a la carte, allowing for customized meals. The distinctive feature of each location is the various food stations where chefs and bartenders custom-prepare food and drinks. Diners can order directly from chefs at different cooking stages, allowing for customizable and interactive meals. Meals are recorded on a personal electronic “chip card” given to each guest; diners pay for whatever was recorded on the card at the end of the meal. The first Vapiano in the U.S. opened in Arlington, VA, in April 2007. A month later, the chain opened a second U.S. unit in nearby Washington, DC, and the third unit opened in D.C.’s Chinatown neighborhood soon after that. The chain now has 11 restaurants in the States. Inspired by traditional Spanish tapas taverns, 100 Montaditos was founded in Spain in 2000. The chain, whose name translates to “100 Sandwiches,” offers at least 100 varieties of crunchy snack-sized rolls made to order and topped with traditional Spanish ingredients like Serrano ham, chorizo and Manchego cheese. In 2011, the chain launched its first U.S. location in Miami. Since then , 100 Montaditos has opened about a dozen more Florida sites as well as locations in Iowa, New York and the Washington, DC, market. The chain recently announced plans to open 28 units in New York City over the next three years, five of them before the end of 2014. With its variety of sandwich options and an adult beverage menu that includes sangria and Spanish wines, 100 Montaditos offers patrons a chance to have a traditional Spanish experience in a fun, casual setting. This entry was posted on Wednesday, October 8th, 2014 at 8:00 am and is filed under Uncategorized. You can follow any responses to this entry through the RSS 2.0 feed. You can leave a response, or trackback from your own site.